Preston said to me today, “I’m going to be sad tomorrow to go to school because we’re learning our numbers to count to 100, and I don’t like to because I can’t count to 100”. So, I said let’s practice! He can count by 10’s to 100 so I thought this shouldn’t be bad. But he was skipping all over the place. He thinks logically so I thought I might as well show him that it’s in a pattern and not as hard as he thinks. He wrote the 10, 20, 30…100. And I told him to start counting & I would write in all the numbers. When we got to 30 I drew the lines to show him the pattern & at about 50 it clicked and he was getting it. 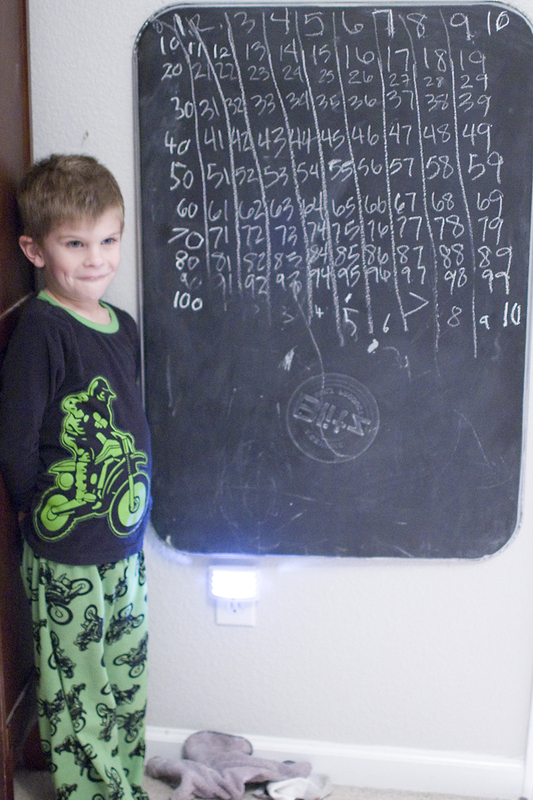 For some reason he mixes up 7, 8, & 9 (we’ve been working on that), so he does have to learn a little more but by the fact that he stood there for this photo and is smiling, that shows that he’s getting it and is proud of himself. I LOVE how happy he gets when he understands a new skill. I love their reactions when something like that just clicks. You do such a great job.